Top performances in her six-meet season included her runner-up finish at the FSU Invitational (17:47.8), which earned her ACC Performer of the Week honors…debuted with a ninth-place finish at the adidas XC Challenge (17:43.6)…was third Nole across the line at ACC Championships and 44th overall (21:15.6, 6k). Outdoor: Placed 23rd at NCAA Championships in the steeplechase, despite illness…qualified out of the NCAA East with a huge last-lap kick to claim the final steeplechase spot on time…helped Seminoles to ACC team title with runner-up finish in steeplechase and sixth-place in 1500, each in personal-bests. Indoor: Anchored FSU’s runner-up finish in the DMR at the ACC Championships, then followed up with a sixth-place finish in the mile. Cross Country: Earned All-South Region honors with 19th-place finish for fourth-place Noles…held down top-three spot throughout the season. 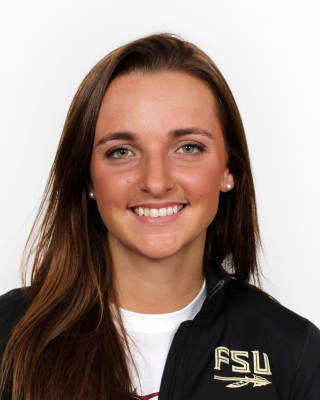 Outdoor: Placed 29th at the NCAA East Preliminiary in the steeplechase (10:17.60)…finished eighth in the steeplechase at ACC Outdoor Championships…posted the ninth-fastest steeplechase (10:16.90) in FSU history at the Payton Jordan Invitational. Indoor: Anchored the distance medley to an 11th-place finish at NCAA Championships for second-team All-American honors…ran season-best mile at ACC Championships (4:53.42). Cross Country: Competed at the NCAA Championships for the Noles…earned All-South Region honors with a 17th-place finish…was a top-five scorer throughout the season for the ACC runner-ups. Sat out her true freshman year as a redshirt. The most decorated high school distance runner from Central Florida since Jenny Barringer Simpson…won three 4A state cross country titles and six individual titles on the track, including the 1600-3200 double as a junior and senior for Dr. Phillips…state cross country runner-up as a freshman while competing for Freedom High…won her third and final state cross country title at FSU’s Apalachee Regional Park course…two-time qualifier for the Foot Locker National Championships, finishing 15th as a senior (17:56)…born May 9, 1995.